Meet Ron Hall, a self-made millionaire in the world of high priced art deals — concerned with fast cars, beautiful women, and fancy clothes. And the woman who changed their lives — Miss Debbie: “The skinniest, nosiest, pushiest, woman I ever met, black or white.” She helped the homeless and gave of herself to all of “God’s People,” and had a way of knowing how to listen and helping others talk and be found – until cancer strikes. The story takes a devastating twist when Deborah discovers she has cancer. Will Deborah live or die? Will Denver learn to trust a white man? Will Ron embrace his dying wife’s vision to rescue Denver? Or will Denver be the one rescuing Ron? There’s pain and laughter, doubt and tears, and in the end a triumphal story that readers will never forget. This biography/autobiography is written in first person and reads slightly like a fiction title. 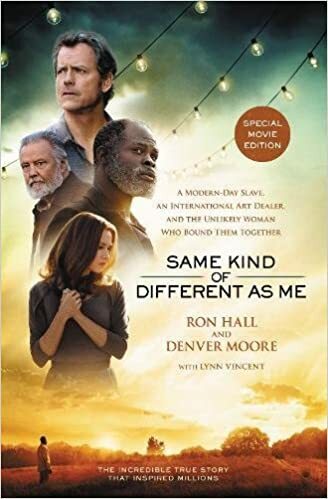 Each chapter alternates between each man, Ron Hall and Denver Moore, as they tell their stories and how their life-paths entwined to form a strong bond of friendship. In the beginning, they are about as opposite as opposite can be, but over their life-experiences, they realize they have more in common than originally thought, and it is Ron’s wife, Deborah that urged them together. It was an interesting book. I liked a lot of the spiritual lessons Denver spoke about – had I sticky notes with me when I read, I would’ve marked a few down. He spoke it how it was, and experienced some profound truths. Deborah left an amazing legacy. Her devotion to help those in need was inspiring, and she followed God’s path for her life tirelessly. This book has some heart-breaking moments, and some beautiful memorable passages as well. The changing chapters with the different perspectives was hard to adjust to at first because there wasn’t anything to differentiate from the other and in the beginning you obviously don’t know their individual voices yet. But once I got a few chapters in, I was able to differentiate with ease. I received a complimentary copy of this book from the author/publisher. I was not required to write a positive review. All opinions expressed are mine alone.